Gardens love rain - and so do gardeners! Most gardeners' feel rain is more beneficial for gardens than an equal amount of water delivered via an irrigation system. Rain is part of the hydrologic cycle. In this cycle, moisture evaporates from the oceans, condenses into clouds, falls to earth, is channeled through rivers, and returns to the ocean. Other forms of precipitation include snow, sleet, hail, and dew. They can all deliver water to gardens. In general, rainwater is the best form of water for gardens. It normally has a pH slightly under 6 and is free of chemical additives. Municipal water sources generally have chlorine and fluoride added, which can have a poor effect on plant growth. Some gardeners even purchase special filters for their garden hose to remove these chemicals. Most gardeners have heard the rule of thumb: gardens need one inch of water each week. Some plants, of course, need more or less. Gardeners should measure rainfall and keep track of the amounts on a calendar. Simple funnel gauges can be purchased at most garden centers. 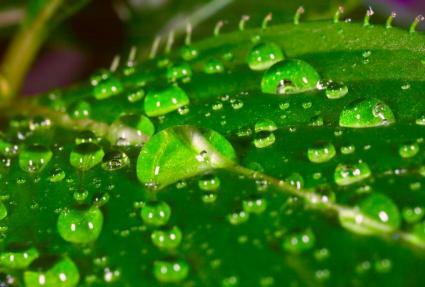 It's best to have a record of rainfall in your own garden rather than relying on figures recorded at the nearest meteorological station, since the amount of rain can vary greatly over relatively small distances. Rate - if a lot of rain falls in a short time, more water will run off the surface of the ground. Topography - water runs off hills and down gullies but gathers in low areas. Soil - sandy soil absorbs water more quickly but does not retain water well. Clay soil sheds water initially but retains it for a longer time after it has been absorbed. Vegetation - plant growth on hills slows the speed at which the water flows downhill, so more water is absorbed and less runoff is created. Vegetation also reduces soil erosion. Urbanization - asphalt and concrete cannot absorb rainfall, so much more water becomes runoff. Artificially-created runoff is often called storm water. Although city storm drains carry storm water away from urban areas, it is still a problem. Up to 70 per cent of the pollution in our lakes and rivers is carried there by storm water. Pollution can limit the availability of drinking water, as well as causing other problems.Approximately half the pollution carried by storm water originates in our yards and gardens! Gardeners need to be especially careful in their use of fertilizers, pesticides, weed killers, and other chemicals. A rain garden is a bowl-shaped garden planted with perennial native plants. It is designed to absorb storm water run-off. These are beautiful landscaping features! They range from small homeowner gardens to complex and large bioretention gardens. More information about creating rain gardens is available here. People have been collecting and storing rainwater for over 2,000 years. 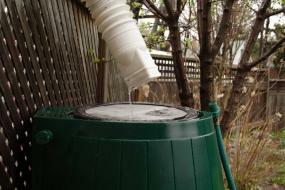 Harvesting rainwater can reduce the gardener's water bill and help conserve an essential natural resource. As underground aquifers are reduced by over consumption and freshwater is contaminated, conserving rainwater becomes more important.Gardeners traditionally use rain barrels to store rainwater. Harvesting systems can be as simple as using gravity to deliver the water. Complex systems using cisterns, pumps, and flow controls can also be installed. More information is available here.